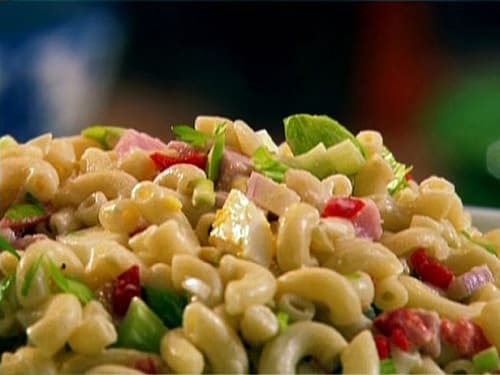 Try this classic American Macaroni Salad Recipe at your next picnic or barbeque this summer, and enjoy a low calorie side dish that tastes so good, it’s hard to believe it’s Weight Watchers friendly. Each 1 cup serving has just 4 Points, and trust me when I tell you that it is not lacking in fabulous flavor or creamy texture at all. By using less mayo, a healthier pasta, and adding in some plain non fat Greek yogurt, I was able to put a much healthier spin on a traditionally fattening recipe. Now you can enjoy this popular BBQ recipe and not feel an ounce of guilt. Seriously folks, if you love yourself some creamy macaroni salad recipes, this low calorie version is a must try! This classic, creamy macaroni salad recipe is a real hit and is sure not to disappoint. Loaded with all the amazing flavor and texture you’d expect, but with a lot less fat and calories, making it just 4 Points per 1 cup serving. Make this as your next summer BBQ recipe and everyone will be happy. Prepare macaroni noodles according to package instructions. Drain and rinse with cold water and transfer to a large bowl. Add in peppers, onion, pickles, celery, and parsley. In a small bowl, mix together the mayonnaise, yogurt, vinegar, mustard, salt, pepper and paprika. Pour over macaroni and toss well to combine. Serve chilled. This pass salad was delicious!! I didn't have low fat mayo so I used 1/4 regular mayo and 3/4 cup fat free Greek yogurt but next time I might ditch the mayo completely. Amazing! !